The food truck industry, which has experienced a boom the last five years, is expected to grow as consumer spending strengthens and more food-service startups adopt the business model, according to analysts. 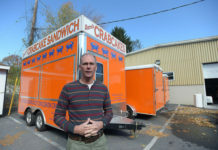 Several owners “cut their teeth” with food trucks because they are cheaper and give the owners an opportunity to build their business. For some, it’s the stepping stone needed before expanding or working out of their own storefront. Cafourek-Belasco and her husband, Tino Belasco, 42, moved to Arkansas to be closer to her parents. But as Tino stayed busy as a wine salesman, Amber grew antsy. In San Francisco, they dreamed of opening a sandwich shop in the Haight-Ashbury district. Instead they found a truck in the Ozarks. Mobile kitchens, initially designed to be parked outside construction and manufacturing sites as easy lunch spots for workers, have grown in popularity. 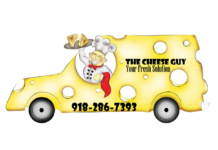 Alan Ellstrand, associate dean of the Sam M. Walton College of Business at the University of Arkansas, Fayetteville, said food trucks are seen as more of a “homemade” local business that can compete with fast-food chains. “I sense that it’s still kinda riding a wave,” Ellstrand said. Nationwide, food truck revenue has grown on average more than 7 percent annually the last five years, according to an IBISWorld report. With 3 percent annual growth projected until 2022. The most popular domestic food trucks focus on sandwiches (34 percent), Asian foods (18.3 percent) or desserts (13.8 percent), the report said. It also warns that an overpopulation of food trucks has created lower profit margins in some cities. 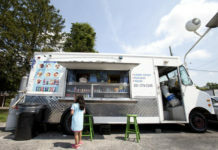 In Arkansas, food trucks have followed the national trend, but the population has certainly not peaked, said Mervin Jebaraj, director of the Center for Business and Economic Research at the Walton College of Business. “It’s a great way to test a food concept,” Jebaraj said. 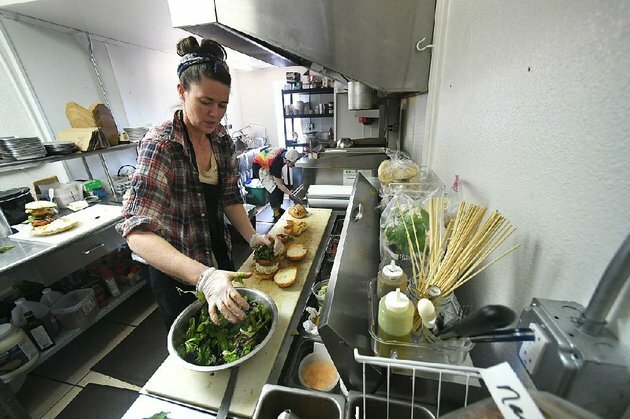 Changes in city ordinances the last few years have made it easier for those interested in starting a food truck business. Overhead costs and risks are lower in a truck, but weather-related factors are heightened, Jebaraj said, which can deter customers and break a business. Natural State, established in 2014, first opened in Fayetteville at the Yacht Club at 617 N. College Ave., a leasing space for food truck operators. With Cafourek-Belasco behind the grill, she developed a rotating sandwich menu with the bulk of ingredients sourced from local farms and co-ops. “When she made that first sandwich, I said ‘Girl, that’s a big sandwich’ and she said, ‘That’s how it’s goin’ down,'” Belasco said. Today, Natural State operates out of a storefront on Emma Street in downtown Springdale. The owners are in the process of getting a wine and beer permit; something they couldn’t obtain with a truck. The winter weather has curbed restaurant foot-traffic all around, Belasco said, but food truck operators get the brunt of it. Extreme weather conditions affect daily sales and the truck itself. Belasco remembered having to shut down early because the truck would freeze, overheat or something would go wrong with the gray water. Increased use of social media has made it easier for customers to find their favorite food trucks. “Being able to post on Instagram, being able to put it on Facebook, being able to pay $30 to sponsor a post and get it out to the targeted demographic of people, is incredible,” said Carol Baker, 27, of Baker’s Wakery. Located on the west side of Interstate 49 and Martin Luther King Jr. Boulevard in Fayetteville, Baker’s Wakery sells baked doughnuts for people with dietary restrictions, offering gluten-free, vegan and vegetarian options. Since starting the gourmet doughnut business last year, Baker has found success in food truck operations, catering gigs, and sharing products through pop-up events at other restaurants and community gatherings. Beer and doughnut pairings, for example, are some of her favorites. For these events Baker’s Wakery bakes tiny doughnuts with different flavors. Each flavor is paired with one of the sponsored beers on tap, creating a flight of beers to go with the flight of doughnuts. Through an event at Columbus House Brewery, Baker worked with Puritan Brewing Co. in Fayetteville to sell the baked doughnuts. Seasonal flavors range from eggnog chai and chocolate strawberry to a cornbread and cheddar doughnut with Sriracha sauce. Hachi Hachi, in El Dorado, a hibachi food truck that opened last year, appealed to locals who said the nearest hibachi-style location is a 40-minute drive to Magnolia or a 90-minute drive to Ruston, La. Owners Erlie Lie and Richie Kwon’s bare-bones menu of hibachi-style chicken, shrimp and steak options have made it a prime dinner and lunch spot for people craving grilled Japanese food. They plan to add noodle dishes to the menu soon. Plans can also fall through and take an unexpected turn. Southern Gourmasian, which transitioned from Little Rock food truck to storefront in 2015, closed its doors on Feb. 5. Chef Justin Patterson did not respond to multiple phone messages. The Arkansas Democrat-Gazette reported last week that Southern Gourmasian’s plans to leave its old building for a new one fell through. In the interview Patterson hinted that he and business partner C.C. Key have plans to re-emerge, potentially with a new restaurant concept.